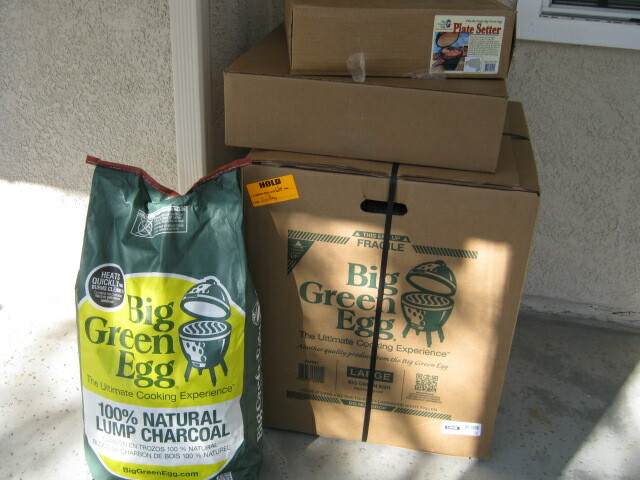 For my birthday and Christmas, I asked my family for money for a Large Big Green Egg. They came through with just a few dollars to spare! The dealer offered an assembled or a boxed Egg, and I opted for the boxed one, figuring I'd learn better how it works if I put it together myself. I got the nest and side tables and they threw in a plate setter for free! The 3rd-party cover was a separate Christmas gift from my parents, and it seems to work fine. Assembly took a while, but that was mainly due to some distractions. The online video was quite helpful although the hardware that came with the Egg was a little different than what was on the video. I picked up some Royal Oak lump charcoal at W-M today and we're planning to fire it off tomorrow for burgers. Can't wait! Congratulations on your new Egg, you will love it! Ask lots of questions here, you will learn a lot. Congrats! You will be an addict in no time! Welcome to the party. Congratulations! Hope you enjoy your egg. Start saving. There will be lots of stuff you'll want to buy. Just got my second egg a couple of weeks ago. Temp controllers are nice but it is best to know how to manually ontrol your temp, then if the controller fails all is not lost. 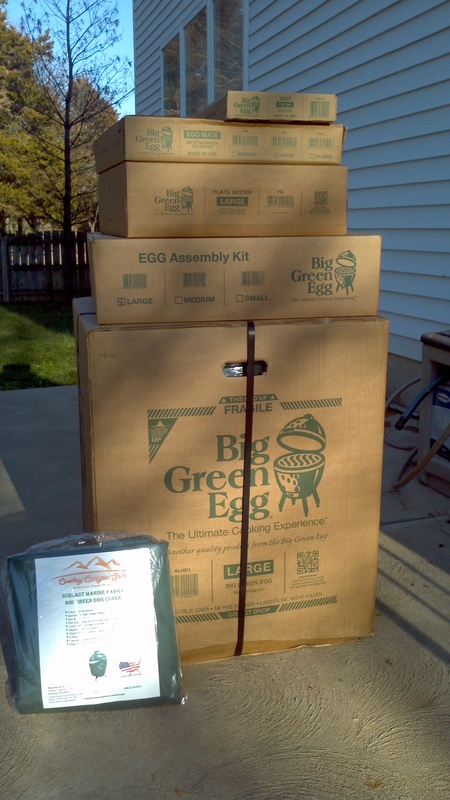 That photo of a boxed up Egg brings back the memory of unpacking mine and laying all the pieces out on the deck. Congrats, welcome and enjoy!!! Had a similar stack of boxes to yours back in July while waiting for my table. The anticipation was killing me. The Egg is an adventure from day one. You are in for some very good times. I drove to Atlanta to get my large and the boxes wouldn't fit in my car. Had I known about this forum then, I would have taken pictures of it in my car. Some of the folks here might have gotten a kick out of seeing the base of my large green egg seatbelted in the front seat and the dome seatbelted into the back! Welcome aboard!! You are in for some great food and great fun. I got my first large in August and just set up my second 5 days ago. Be warned the guys and gals around here encourage that kind of behavior. FWIW I am with @calracefan. I'd save the money on a controller for now and put it towards other Eggcessories. Learn to control the temps manually. Then if you still want a controller, like @calracefan says, you'll know how to control the Egg manually if it fails. Welcome...a thermapen is a great little tool. Just a suggestion- If your band bolts are not bending, tighten them some more. This forum has a lot to offer and the people are friendly, so far there is only one idiot, but he knows what he is doing. Welcome. I agree about the temperature control, unless you plan to cook butts every weekend. I find I don't need it during the day, but I would like the security for overnights. One item that I find essential, or at least very, very handy: the Maverick ET 732, a wireless thermometer that tells you the temp of your food and your Egg. I had my Egg for about eight months before getting the Maverick, and I was constantly going outside to check the temperature. Now, I just look at the monitor from inside. I also find the High-Que grate extremely important. It made a tremendous difference in the amount of time needed to get roaring hot and I don't have to strip clean my Egg very often now for slow cooks. Thanks for the tips everybody. Since I'm out of money for now, I'm gonna have to learn to manually control the temp, but it is a good suggestion to do that anyway in case you ever have to. And about what @Smokin_Trout said about the bolts, I tightened them as tight as I felt comfortable doing. I saw the band prongs (the part that turns outward with the holes for the bolt) bend some toward each other as the nut was tightened, but I didn't see the carriage bolts themselves bend. The lid opens and closes fine and there's no up-and-down play on either band. I think I'll tighten them up another quarter-turn or so just to make sure. So long as I'm only using smaller hand tools (i.e. nothing like a torque wrench) I assume there's no chance of damage to the base or dome? Congrats on your new Egg. I'd skip the deep dish stone (but definitely get the BGE pizza stone) and the ash pan. Cast iron grate is nice but not necessary. Temp control devices are good, but also not necessary. Learn how to control it manually first. You never know if/when a pit controller might break/your power goes out. I'd invest in a good thermometer first. Thermapens are great as is the Maverick 732. The addiction has just begun for you. "And about what @Smokin_Trout said about the bolts, I tightened them as tight as I felt comfortable doing. I saw the band prongs (the part that turns outward with the holes for the bolt) bend some toward each other as the nut was tightened, but I didn't see the carriage bolts themselves bend. The lid opens and closes fine and there's no up-and-down play on either band. I think I'll tighten them up another quarter-turn or so just to make sure. So long as I'm only using smaller hand tools (i.e. nothing like a torque wrench) I assume there's no chance of damage to the base or dome?" My bolts don't bend. The bolts are so tight the ends of the bands are almost touching. I think some eggs (maybe newer ones) come with bolts that don't bend. This post talks about it some, "OK my ring just slipped…. Help". Try searching for it. It may be helpful to you. Be sure to check your bolts after a couple of cooks, they loosen with expansion and contraction from heat. Also good to check periodically anyway, you don't want to open the egg and have the dome hit the ground ! I would wait a while to see what you need or want...including a table. Your priorities may change once you get really rolling. Thanks for the tips everybody. I'm definitely going to wait and see what I really need before going out and buying anything. I can do the basics and that's good enough for now. I had a good time firing up my new Egg tonite and grilling burgers. They came out great but not perfect so I still have lots to learn. As I fiddled with the bottom draft intake and the chimney cap it kinda felt like when I learned to drive - you remember how that went, right? Gas-brake, gas-brake, gassss....BRAKE!! hopping all over the road. I also made the same mistake that @jfm0830 made - after I got the fire going, I let it heat up for a few minutes while I chopped some veggies (my normal procedure with my Webers). Came back and it was a little under 200 but hot to the touch. I carefully lifted the lid and then noticed the needle spining counterclockwise. Yikes! First lighting and I already got it around 900! To any first-timers reading this: once the fire is going good, keep a sharp eye on that dude. Jig, I cook my burgers reverse sear. PS in and around 250-300. Once I can flip the burgers with no problem I remove the PS and let the egg temp climb to around 550-600 and check with the thermapen. Just a thought. Have fun with it. We've found it's tough to really mess something up on the Egg. Even when we have cooked something more than we typically care for it still comes out really good.